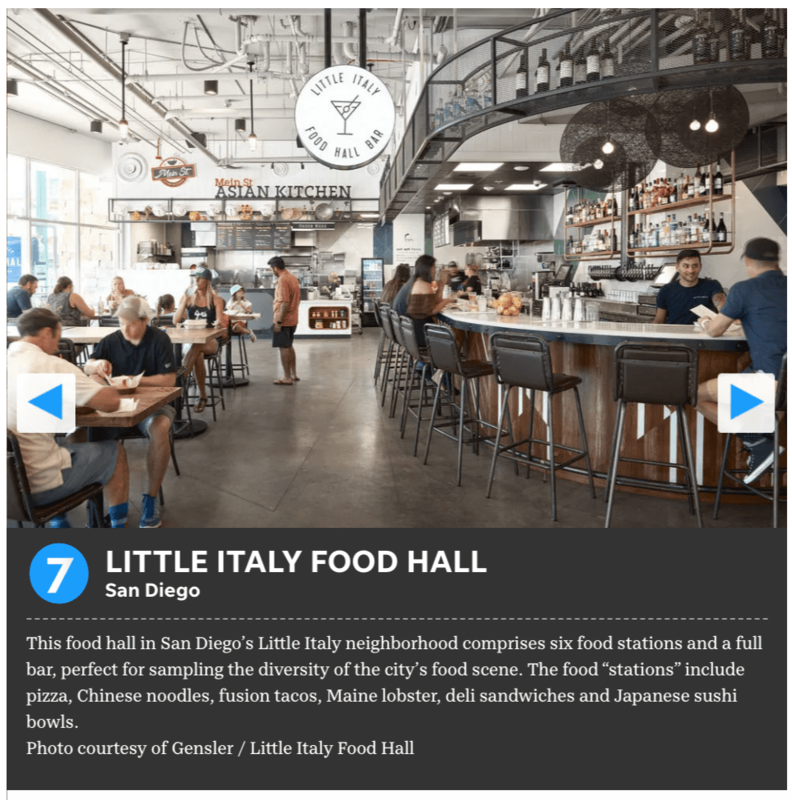 Our very own Little Italy Food Hall created noteworthy buzz last month, ranking number 7 in USA Today’s list of Best New Food Halls in America. A panel of food editors and contributors for USA Today and 10best.com directed the survey. Readers were asked to vote from a pool of 20 nominees until the 10 best were named, complete results are available on their website. We are honored to share this nomination and are always looking forward to welcoming new and returning guests to our space. At just under a year old, we’re so excited to keep up the momentum and consistently come up with new ways to entertain our guests and continue earning this kind of recognition. On top of our live cooking demos, movie nights, outdoor bar happenings, food stations, and the 11,000-square-foot Piazza della Famiglia, you can expect to see even more coming from Little Italy Food Hall soon. “The Little Italy Food Hall was a project of passion and commitment. It is exciting to be recognized amongst the best projects in the country. We will continue to work hard to serve the Little Italy community and share our passion with our guests,” said Mike DiNorscia, CEO of Grain & Grit Collective. Check out the story posted by the San Diego Union Tribune. Little Italy Food Hall offers $10 lunch specials weekdays from 11am to 3pm. Join us for happy hour food and drink specials, weekdays from 3pm to 6pm indoors and until 7pm at the piazza. Check out our Events page to keep up with our current events and follow us on Instagram for the latest on the Little Italy Food Hall. Thank you to all our vendors, guests, and our wonderful Little Italy neighborhood, we are so grateful for all your votes and continual support!